TL;DR Just want to get to the point? Read how to fix this without the intro. Occassionally, you may want to update the title of a Page in your WordPress site. That’s not what we wanted, though. Luckily, we have full control over the navigation text, too. 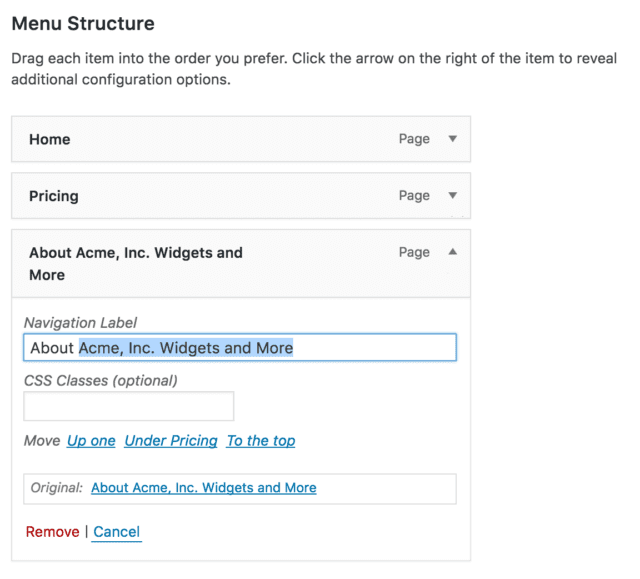 In WordPress, go to Appearance > Menus. 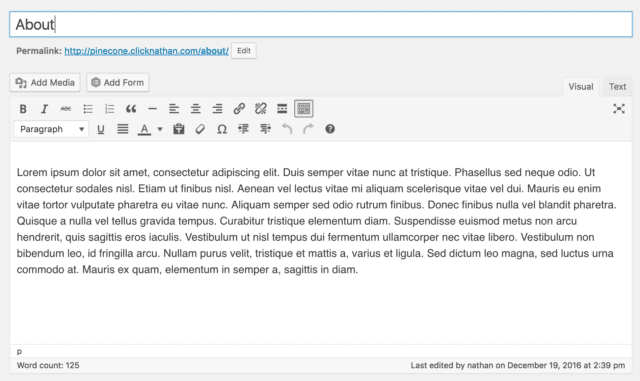 Find the Menu you’re working with via the Select a menu to edit: dropdown. For themes I build, this is typically called “Primary” when dealing with the menu at the top of all pages, or “Footer” for those at the bottom. Select the menu, then click the Select button. You’ll then see a list of rectangles, each representing a navigation item in the menu bar you’re working with. Click the little arrow on the right side of the navigation menu to expand it’s options. In the highlighted blue area above, you can simply scrap the additional text, save the menu via the blue Save Menu button, and voila, the front end will now show our concise menu again. 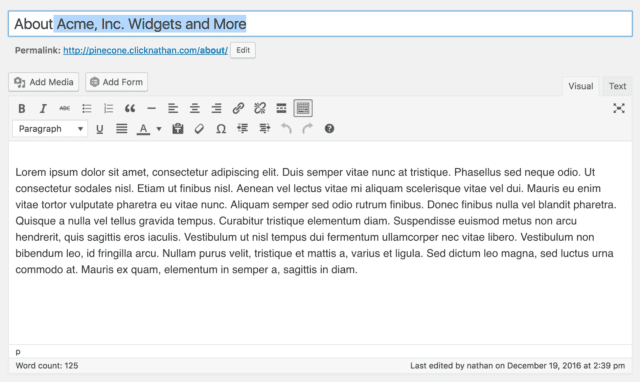 This is where I explain how to use WordPress, as opposed to my other blog where I share code snippets. I use Flywheel Managed WordPress hosting, and can’t recommend them enough. When I’m not building the Internet, I live in a van with my family, travel full-time and write for Wand’rly and Campendium. When I try this, it also alters the menu name in real time, so it’s not working as you described. It shouldn’t, if it isn’t allowing you to edit them in Appearances > Menu then your theme or a plugin is messing with things. I believe edited post title does not affect page tile! Only once you’ve changed it in the Appearance > Menu section will it stick. It sounds like you may be doing it backwards, go back into the Menu editor and change it again.